The maxillary front teeth play an essential role in dentofacial esthetics . For example, the absence of one or both maxillary lateral incisors (either congenitally or as a result of being extracted for reasons such as diminutive tooth) can significantly impact the dentofacial appearance, oral function, psychological well-being, and quality of life of the patient [2–5]. The treatments for these missing maxillary lateral incisors usually include prosthetic replacements (e.g., implantation, fixed, or removable dentures) or orthodontic space closure with canine substitution [6–10]. Numerous studies have demonstrated the advantages of canine substitution to replace the missing maxillary lateral incisor, including good esthetics [11, 12], long-term periodontal and temporomandibular joint health [13–15], and the avoidance of prosthetic materials in the oral cavity after treatment [16, 17], as well as reduced costs in treatment . A challenge of canine substitution in practice is to recontour the shape of the canine after space closure by grinding and reshaping the canine enamel to produce esthetically pleasant edge width and height [10, 18, 19]. Clinicians usually use the maxillary central incisors as the reference for recontouring after the lateralization of the canines [10, 18]. However, it is still unclear what canine edge width and height is the most esthetic shape to the patients as well as to the orthodontists. A number of previous studies have found that the shade, gingival height, symmetry, crown width, crown height, and tip morphology of the substituted canine could affect the esthetic treatment outcome [19–23]. And there was a discrepancy in the esthetic perception between laypersons and orthodontists . The laypersons were found to be not as perceptive and critical as the orthodontists when evaluating smile esthetics . A result that was considered by orthodontists to be less than ideal may well be perfectly acceptable to the layperson [11, 22, 24]. 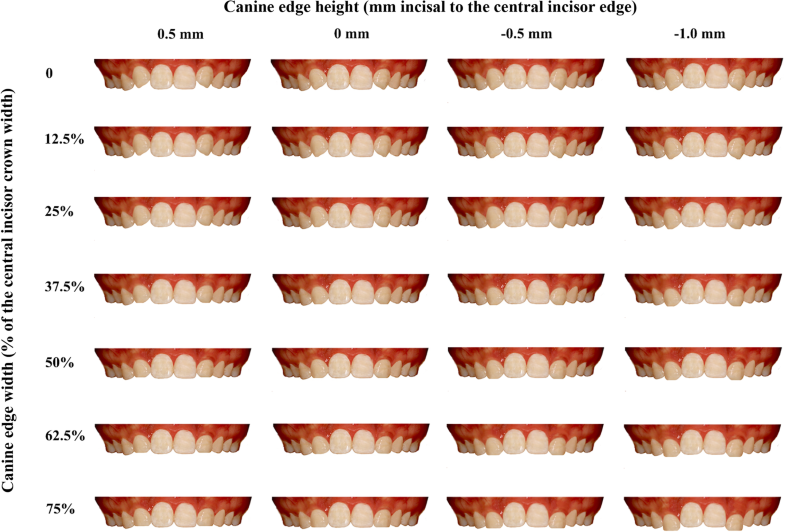 It is important to understand the influence of the canine shape on dental esthetics during the patient-centered treatment of canine substitution [25, 26]. The shape of maxillary central incisor is generally used as the reference for reshaping the canines during canine substitution treatment [10, 18]. The most esthetic width ratio of the maxillary lateral and central incisors has been considered to vary from 0.62:1 to 0.72:1 [28–31]. 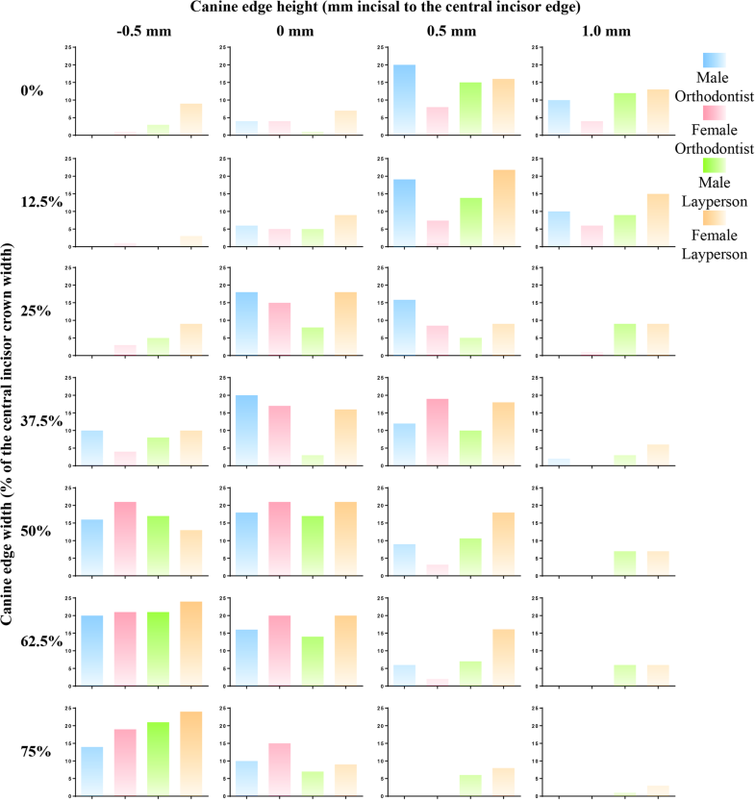 The canine edge width of 62.5% of the central incisor width in the study, which was ranked as top 1, was also the closest ratio to the naturally esthetic standard ratio [11, 24].